Find and compare the best prices from a range of well known car rental companies at Strasbourg Airport. This is a free to use facility, enabeling you to book direct with the company quoting the price. 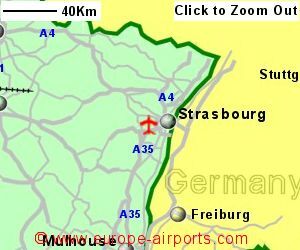 Strasbourg Airport, otherwise known as Entzheim Airport, is located 15Km South West of Strasbourg, capital city of the Alsace region. Strasbourg is situated on the river Rhine, close to the German border. 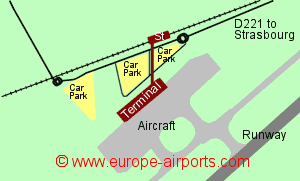 Entzheim railway station is within walking distance (approximately 400m of covered walkway)of the airport and connects to Strasbourg upto 4 times per hour (where there are train connections, including the TGV). A shuttle train runs between the airport and Strasbourg station every 15 minutes at busy times. The 10 minute journey costs 4 Euros. A shuttle bus runs between the airport and Strasbourg every 20 or 40 minutes (depending on time of day) connecting with the tram service. Facilities include 3 bars/restaurants, 2 cash dispensers, 4 shops including duty free, business centre and meeting rooms, and FREE WiFi Internet access. There is also a flight simulator available to professional pilots and members of the public. 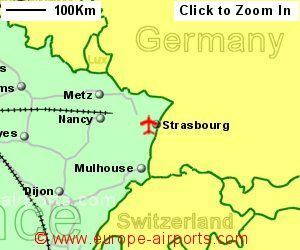 1.2 million passengers passed through Strasbourg airport in 2017, an increase of 12% from the previous year.